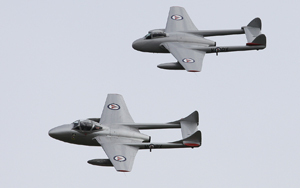 September 7th and 8th saw the crowds heading for Duxford’s annual September airshow. 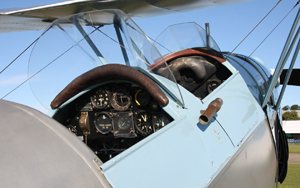 Billed as a family airshow, it brings together modern jets to piston engined warbirds, helicopters to classic biplanes, and for this year a Boeing 747 airliner!! Although I only attended on the Sunday, I have heard the 747 display was great. The weather looked as if it was going to be a beautiful day at 8am. This wasn’t to be. 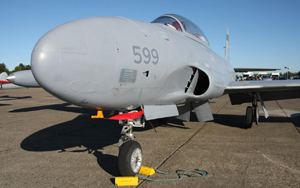 But for the opening of the flight line walk, the skies were blue. I wasn’t overly thrilled by the flying programme at first. It looked a bit sparse, but after a better look at what was on the flying list, I think it was more quality over quantity. 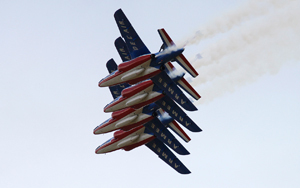 This year the Sunday show was set to be the battle of Aerobatics. 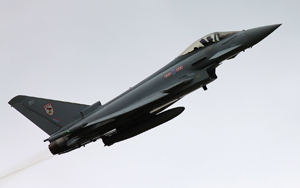 With the skies looking ominously grey, the air display kicked off promptly at 2 o clock with the 29(R)Squadron Typhoon display from RAF Coningsby. I must admit that this years Typhoon displays have stepped up to another level. Flt Lt Jamie Norris has wowed the circuit all season. His Duxford display was brilliant. I think he did a superb job keeping the Typhoon within Duxford’s comparatively small arena. There was plenty of noise and lots of use of the ‘burners’. Another of the RAF’s assets, (although not for much longer though) was due to display next but due to a shout, 22 squadrons Sea King, based at Wattisham, had to leave early. 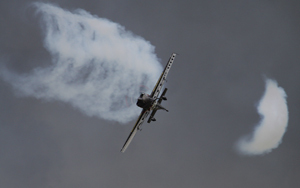 The first of the aerobatic displays started with an absolute master class in precision aerobatics. 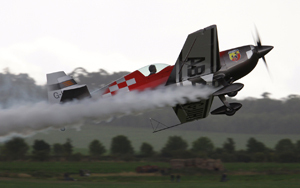 Mark Jefferies is a hugely successful aerobatic display pilot having achieved 3rd in the 2011 World Aerobatic Masters and 9 times UK champion among his accolades. Sponsored by Abarth cars and flying the new Extra 330SC, Jefferies flew a real crowd pleaser. Unfortunately at the end of the display the heavens decided to open up with an almost monsoon style deluge!!! 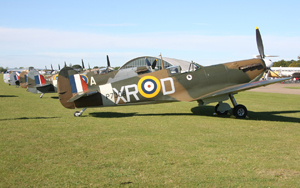 This in turn held up the Battle Of Britain Memorial Flight. With the rain cleared the BBMF appeared from the gloom. 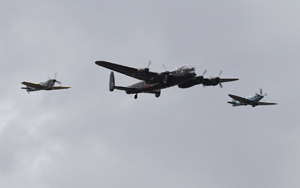 The Lancaster was flanked by 2 Spitfires and performed two formation passes before splitting. 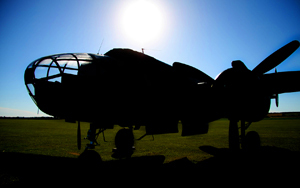 With a solo Spitfire display, the Lancaster had started its run in only to be told that was it. Rather disappointing I felt. 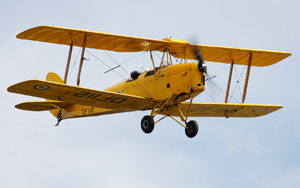 With the non arrival of the Lancaster’s solo display, Brendan O Brien took off in his super modified Piper Cub. I am pleased that O Briens alter ego has finally been ditched. It was fine for a one off but I did feel it was getting a bit long in the tooth. 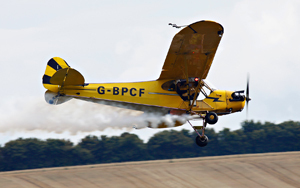 It was great to see the ultra talented Brendan land his Cub on top of a trailer being towed down the runway. Finally we had gotten a B-25 back at Duxford. 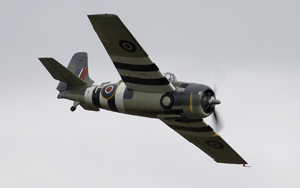 Its been a few years since a Mitchell appeared at a Duxford display. 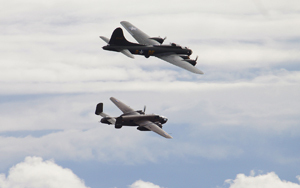 The Royal Netherlands AirForce Historic Flights B-25 has been doing the rounds in the UK this year and very welcomed it is. 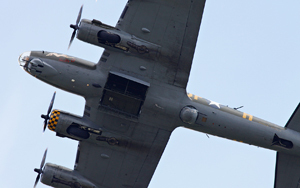 What was even better was the fact that she flew in formation with another American Bomber, B-17 Sally B. The Mitchell seemed pretty popular as she also displayed with a lone T-28 Fennec after which the Fennec joined up with a second T-28. 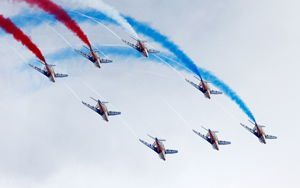 The first of the Aerobatic teams came in the form of the French Airforce’s Patrouille De France. Their display was very good with the normal mix of tight formation passes and exciting crossovers. 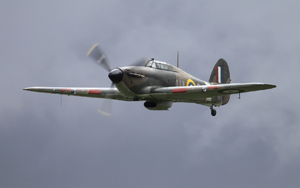 HAC’s Hispano Buchon and Hawker Hurricane flew together in a nice little tail chase sequence. 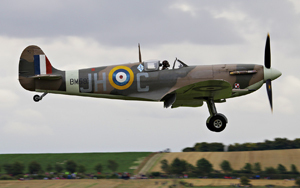 The Hurricane seemed to be struggling at first to get to grips with the ‘hun’ but within a few passes of the airfield, it was right on its tail…No Duxford airshow would be complete without the usual mass Spitfire formation. 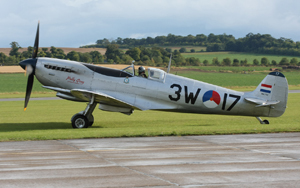 The 2013 show saw six Spitfires, varying from a MK1 to a MK XIVE, give some evocative 3 ship passes before splitting to beat up the airfield with a great tail chase. I will never get tired of seeing Spitfires over Duxford, they bring about that 40’s feeling and it almost feels like we’re back in wartime Duxford. 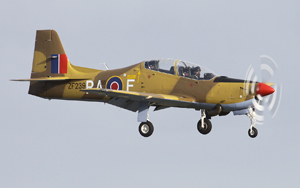 With the weather not improved much it was left to the RAF’s finest to close the show. 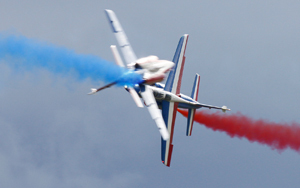 The second of the Aerobatic teams arrived right on schedule to give the crowd what they had been waiting for. 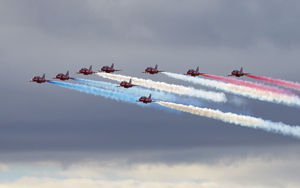 I think the Red Arrows should not be under estimated in their crowd pulling power. People of every age flocked to the front to catch the guys perform the tight formations and syncro passes that have come to be associated with the Reds. Their Duxford display was no different..
On reflection, the September show, I thought, was again a good mix of old and new, jet and piston. I would like to thank Esther Blaine and her team for the great hospitality and help they give us media guys. The flight line walk team are always friendly and like a good old chat. 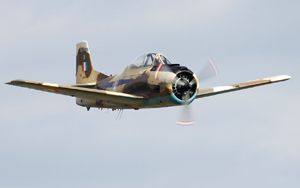 I only have one complaint about the day……The T-28, It decided to park right in front of us and perform engine checks…..when it was raining!!! So while holding down chairs, hats cameras and anything not anchored to the ground, we were getting blasted by the rain it was driving in to us too!!! 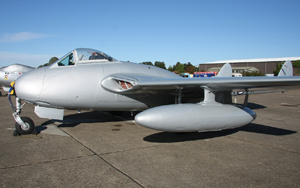 You’ve got to love the British airshow experience!!!!!!! !